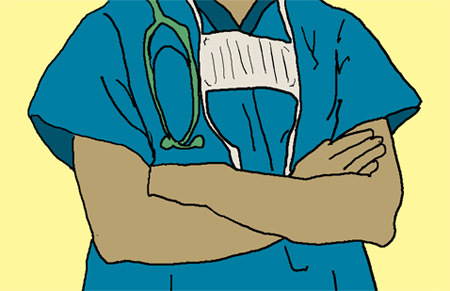 Snazzy green or blue scrubs may have substance in addition to style. Scrubs used to be white—the color of cleanliness. Then in the early twentieth century, one influential doctor switched to green because he thought it would be easier on a surgeon’s eyes, according to an article in a 1998 issue of Today’s Surgical Nurse. Although it is hard to confirm whether green scrubs became popular for this reason, green may be especially well-suited to help doctors see better in the operating room because it is the opposite of red on the color wheel. Sweet article. It’s always neat to see how color has a subtle role in the ways of the world. Wonder if colorblind people are successful surgeons? Why do I get electrical shock-like feelings in my hands and fingers when I sneeze? Not all Spanish doctors wear white. In Catalonia, doctors and nurses wear green or blue in the operating room. 3 – When everything is green, it makes everyone in the OR a little more careful around those items… they’re subconsciously assumed to be in the sterile field. Not perfect, but we have many similar interests. Green scrubs and surgical linens were originaly adopted in the 1950’s because blood stains often leave a greenish discoloration when laundered. Hospitals (who used to universaly provide the scrubs) switched to green in order to save money on linens which had to be thrown out or were rapidly destroyed by frequent bleachings. Scrub clothes are not visible in the operating room. Just the gown, caps and gloves. Surgical linens (drapes, gowns and towels) often were various shades of green. During the 70’s many hospitals did switch to blue, a more soothing color on the eyes. Which also helped centralized laundries from mixing up different institutions linnens (blue for one hospital, gren for another). Most scrubs in operating rooms remain blue or green today, however, some facilities have gone so far as to have scrubs in an obnoxious pink color, which helps to lessen the impact of scrubs ‘walking off’. The theories behind the use of green scrubs in this article are interesting and scientificaly correct, but played little to no role in most institutions conversion to the use of colored scrubs during the mid-part of the 20th century. I’ve always heard that one of the primary reasons for wearing green (or certain blues) in surgery is because red and green are opposites on the color wheel, and when you combine the two, as artists do all the time (basic color theory and I’m a professional artist), it neutralizes the color red (blood), as in it turns a neutral brownish color, making it not so startling. Why is it startling? Because humans (and mammals) respond emotionally to the color red more than any other color (artists manipulate color for that very reason! ), and the emotion red evokes is one of Stress (duh! ), which is the last thing a surgeon would want to increase while operating! I personally think that the colors are much more friendly. Our environment has green bushes…trees, and blue oceans & skies..it is a more natural, less stressful color and allows a person to feel good. why the doctor wearing green colour cloth in operation time? why did use green dress in operation therater doctors? For those who are still confused, even i would be if i didnt knew it before hand, its as follows. You must have heard of complementary colours. In after effect, when you stare at a certain color as in this case red, your eyes will lose focus and when you will see surroundings, your eyes will tend to see the complimentary color of the color you initially stared at. Thus it helps surgeons as the light green after effects blends in the real color and thus helping them keeping them focus. We wear surgical gowns over “any color” scrubs in operation theatre. Busted! please write something you know about! In 1951, Mark J. McCann Jr, Director of Photography at Massachusetts General Hospital, introduced a teal green color, as a replacement for the then standard white. The Rit Dye color, teal, was chosen as a best match for the saturation characteristics of the new Kodak color movie film. Physicians appreciated the reduction in glare, and adopted teal as the standard. Mark was my father, and as a child I remember him coming come with the clothing for my mother to dye, and the drapes hanging all over the house to dry. Years later I asked him to detail the story. Mark passed away in 2007 after serving as Director of Photography for the NASA Research Center in Cambridge.